Leaks and rumors say that Apple’s iPad Mini setting up for an October debut will end up having a 7.85-inch display, making for a larger tablet than typical 7-inchers. As a result, this new iPad has attracted increasing attention from many tablet lovers since they can therefore experience a great visual feast on the iPad. It’s a great pleasure to enjoy movies and videos on Apple's tablet especially when you are on a long boring trip but it’s a pity that this tablet only supports MP4, H.264 files, worse still, you cannot run your disc directly on it, making you difficult to watch DVD movies on this cutting-edge product. Now that there are many people, especially Mac users who have an affinity to Apple products, curious about how to rip DVD movies to iPad Mini on Mac, here a professional DVD ripper for Mac is recommended to you to exclude all your difficulty and anxiety. Well, MacX DVD Ripper Pro is just too good not to share. 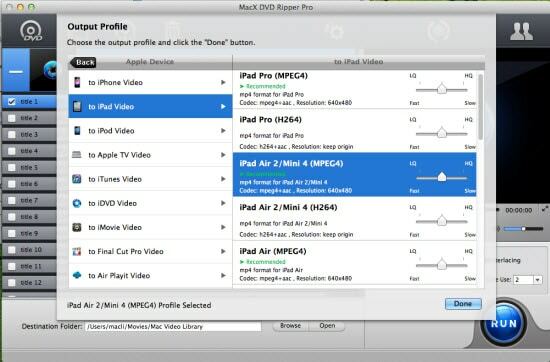 This DVD converter is an easy-to-use program that helps you rip new DVD movies to iPad Mini supported video format like MP4 on Mac at fast ripping speed while retaining high video quality, enabling you to view movies on your big screen no matter you are on a boring flight or by the sea. What’s more, this DVD ripper for Mac (El Capitan/macOS Sierra supported) is versed about circumventing copy protection, so that you can you can leave the interruptions behind and smoothly convert any newly published DVD movies to iPad without worrying about encryption. Fast to copy protected DVD movies to iPad Mini 4/3/2 iPad Pro/Air 2 supported formats MP4, MOV, AVI, H.264 etc on Mac devices and Windows (10). After free download this DVD ripper for Mac or on iPad mini DVD ripper for Windows (10), click "DVD Disc" button to import the DVD movie you want to rip. You can also load DVD folder by clicking "Path" button. Since you want to view DVD movie, select the output video you desire. Here we choose "to iPad" as output video format. After finish the above steps, click the "Start" button to start ripping DVD movies to iPad Mini on Mac OS, you could view the conversion progress and are able to cancel the converting process at anytime. Note: For those who would like to rip DVDs to more output formats, the software would also offer a hand and give you a choice to rip DVD to audio music, MP4, MOV etc. To finally watch DVD movies on iPads, there is one more step to do - transfer ripped DVD files to iPad. The 5-star iPad file transfer tool - MacX MediaTrans can do you a favor with this, which works proficient in copying videos from Mac computer to iPad iPhone iPad. Use the best iTunes DVD ripper to easily and fast rip & convert DVD to iTunes compatible formats (MP4, MOV, MP3) as well as remove various copy protections like DVD CSS, region code, Disney, etc. The following guide shows you how to transfer DVD to video/audio format for playback on iPad/iPad 2, thus you can freely enjoy your favorite DVD movie on your iPad or iPad 2 anytime and anyplace.